Ms. Janet Looney Farnsworth, age 64, a 30 year resident of Lindale, Ga., formerly of Battle Creek, Mich., passed away Saturday, January 9, 1999. Survivors include her mother, Marian Looney of Lindale, Ga.; two sisters, Carolyn Nousiane of Rome, Ga., and Marcia Millsap of Lindale, Ga.; a brother, John Looney of Decatur, Ala.; and numerous nieces and nephews. Contributions may be made to Hospice. National Cremation Society of Atlanta is in charge of the service. Funeral services of Mrs. Sid (William Sidney) Farrer, who died Wednesday (6 Mar 1935) afternoon, were held Thursday afternoon (7 Mar 1935) at the Eagle Lake Cemetery (Polk County, FL), with Rev. Hall of the Assembly of God church officiating. Mrs. Farrer is survived by her husband, two daughters, Mrs. Zora O'Neal of Bartow and Miss Verna Lea, and three sons, Earl, Russell, and J.K., and her parents, Mr. and Mrs. J. M. (Johnson Milligan) Adams of Rome, (Floyd County,) GA. A large crowd attended the rites, and there were many beautiful floral offerings. Mr. William Nettles Ferguson, age 99, of Cave Spring, formerly of Rockmart, passed away Tuesday, February 15, 2000 at his residence. Mr. Ferguson was born August 15, 1900 in Rockmart. He was a retired civil service employee and a member of the Rockmart First Baptist Church. He was preceded in death by his wife, Clifford Waterhouse Ferguson; parents, Thomas Roland and Barbara Lizetta Nettles Ferguson. Surviving are brother, Ray Ferguson of Marietta; three sisters, Leonora Ferguson Mintz of Rockmart, Ruth Ferguson Lumpkin of Rockmart and Betty Ferguson Shoaf of Tallahassee, Fla.; and a number of nieces and nephews. Funeral services were held Thursday, February 17, from the Freeman Harris Funeral Home Chapel with Dr. David Taylor officiating and eulogy by Rick Williams. Interment followed in the Rose Hill Cemetery with Dr. Ray Hopkins officiating. Pallbearers were Donald Mintz, Stewart Mintz, Jerry White, Bobby White, Jimmy Lester and T. A. Willingham. Liz Willingham and the following WMU Morning prayer group of First Baptist Church served as honorary pallbearers; Linda Brackett, Kay Bullard, Peggy Cagle, Beth Lester, Bettye Mintz, Judy Stoyle, Debbie Thompson and Evelyn Tyler. Freeman Harris Funeral Home had charge of the arrangements. Dr. Albert Fiedler, retired chemist in the fields of celluloid and plastic, died in a Rome hospital at 10:47 p.m. Saturday following a three-week illness. Dr. Fiedler, who was 75, resided at 39 Glenwood Apartments. For over 35 years, Dr. Fiedler and his brother owned and operated the Empire Film Industries, doing productions and film laboratory work in New Jersey, New York and Hollywood. After retiring from the motion picture industry, he acted as a consultant in several capacities, later developing a process for plastic coated gloves which he sold to the Advance Glove Co. In 1952 he moved to Rome to manage the Bee Safe Glove Co., for the Advance Company, and he retired from this activity in 1958. Dr. Fiedler was a graduate of Columbia University and did post graduate work at Berlin University, where he studed under Dr. Emil Fisher, receiving a PhD in chemistry. After receiving his doctorate, he began his career with the Celiod (Celluoid? )Company of New Jersey, as a chemist. Born in Brooklyn, N.Y. Nov. 20, 1886, he was the son of the late Mamia Sherer Fielder and Dr. Max Fiedler. Dr. Fiedler was married to the former Miss Winnie Frances Kolb, Sept. 7, 1937. He was a member of the American Chemical Society, Georgia Section, the Rome Lodge of Elks, served on the Cerebral Palsy Board, and was a communicant of St. Mary's Catholic Church. Funeral services will be held at 9:30 a.m. Tuesday in the chapel of Jennings Funeral Home with father John F. McDonough, pastor of St. Mary's Catholic Church officiating. Interment will be in East View. The body will remain at the funeral home where the Rosary will be recited at 7:30 tonight. Pallbearers include Jerry Barton, W. J. Neathery, Harry Lovoenberg, Cllaude Bradley, Gordon Dison and Guy McJunkin. Mr. Jack Lunsford Field, 58, formerly of Dalton, died Monday at 6:30 p.m. in St. Mary Hospital in Knoxville, Tenn. He is survived by his wife, Bonnie K. Field of Knoxville; two son, Mark Field and Lynn Davis of Knoxville; two daughters, Tara Field of Knoxville and April Field of Orlando, Fla.; mother, Tennie Lunsford Field of Knoxville; two half sisters, Dianne Smith and Glenda Bishop of Dalton; one half brother, Allen Bishop of Longview, Texas. Soon after he had partaken of his midday meal, C. E. Fife, aged 65 years, a well known Floyd Springs man, dropped dead while sitting on a chair on the front porch of his home. Mr. Fife appeared in the best of health at luncheon and his family were shocked at his sudden death. The deceased is survived by a wife, five sons and two daughters. He led a quiet, law-abiding life, and was a Christian, and a member of the Floyd Springs Methodist church. The funeral will be held from Floyd Springs Methodist church at 11 o'clock today, the Rev. Mr. Mize officiating. Mr. Sidney Fincher who died Monday night at his residence near the brickworks was buried yesterday afternoon in North Rome. Mr. Fincher was an excellent young man about 24 years of age and had many friends. He has been sick for several weeks and it was not a month ago that a brother of his died of typhoid fever, the same dread disease that carried this unfortunate man to the grave. Mr. Eakes held a simple service at the grave. Thomas Kenney Fincher Sr, 57, Freeman Ferry Road, Rome, Rte. 6 died at 6 a.m. today in a Rome hospital following an attack suffered a week ago. Mr. Fincher was born in Floyd County Nov. 12, 1910, son of Mollie Hutcherson Fincher and the late Henry Clay Fincher and had spent his entire life here. He had been employed by Celanese Fibers Co. for 37 years, prior to his retirement in January, 1967. He was a member of the North Rome Methodist Church and the East Floyd Masonic Lodge. His wife, the former Thelma Ann Fowler died March 10, 1961. Survivors include two sons, Kenny and Wendell Fincher, both of Rome; mother, Mrs. Mollie Fincher, Miami, Fla., four brothers, Gordon and Melvin Fincher, both of Miami, Fla., Walter Fincher, Silver Creek and Harbin Fincher, Marietta; three grandchildren and several nieces and nephews. Funeral arrangements are incomplete but will be announced later by Jennings Funeral Home. Funeral services for Thomas Kinney Fincher, Sr., 57, of Freeman Ferry Rd. Rome, Rte. 6, who died Tuesday at 6 a.m. in a Rome hospital following an attack suffered a week ago, will beheld at 4 p.m. Thursday in the chapel of Jennings Funeral Home with Rev. Ralph Mabry officiating. Interment will be in East View Cemetery. The body will remain at the funeral home and the family will receive friends there from 7 until 9 p.m. today. At other hours the family will be at the residence of the son, T.K. Fincher, Jr., Freeman Ferry Road, Rome, Rte.6. Mr. Fincher had spent his entire life in Floyd County and for 37 years was employed by Celanese Fibers Co. Prior to his retirement in January, 1967, he was assistant foreman in the spinning department. He was a member of the North Rome Methodist Church, East Floyd Masonic Lodge, and the Low 12 Club. His wife, the former Miss Thelma Ann Fowler, died March 10, 1961. Nephews will serve as pallbearers they include William, Lonnie and Gene Barker, Curtis Worthington, Steve Fincher and Perry Farrar. Obituary published 25 January 1934 in the Dalton, Georgia weekly newspaper. Mrs. Lemmer Flood, 58, of Old Grade Road, died in the local hospital Tuesday evening at 7:55. She is survived by her husband, J. H. Flood; a daughter, Mrs. Edna Parks of Dalton; seven sons, John of Spring Place, Charles Mack, Floyd, Wallce, D. L., Gerald and Rayburn all of Dalton; mother, Mrs. Azzie Wilson of Dalton; two sisters, Mrs. J. C. Flood and Mrs. W. C. Hix both of Dalton; 13 grandchildren, nieces and nephews. Funeral services will be held at the Antioch Baptist Church Friday at 2 p.m. and Rev. Benny Waters, Rev. Leonard Cordle and Rev. Thurman Hightower officiating. Burial will be in the Whitfield Memorial Gardens with Kenemer Brothers Funeral Home in Charge of funeral arrangements. The body will be at the home of her daughter, Mrs. Parks on Old Grade Road after 6 p.m. tonight. Mr. Cecil E Floyd, age 78 of Rome passed away Sunday, July 5, 1998. Mr. Floyd was born May 11, 1920 in Chactaw County, Ala.; and was a retired Master Sgt. of the U.S. Air Force. He was preceded in death by his wife, Gladys Y. Floyd; a son Joseph Eugene Floyd; and his parents, Ruby Mixon Floyd and L. McNeil Floyd. Survivors include two sisters, Sarah Skinner of Baldwin County, Ala., and Annie Ruth Schleth of Cedartown; and three brothers, Joe Hutchinson, Jr., A.J. Hutchinson and Sput Hutchinson. Funeral services were held Wednesday, July 8, 1998 at Gammage Funeral Home with the Rev. Dorsey Welchel and the Rev. Moses Wilson officiating. Interment followed in Northview Cemetery with full military rites conducted by the Brewster Cleveland Post #86. Pallbearers included Roland Jackson, Hayward Chandler, Tony Boling, Gene Bentley, Byron Slaughter, Jason Slaughter, George Slaughter, Gary Jackson and Wesley Tallon. Gammage Funeral Home of Cedartown was in charge of the arrangements. Mr. L. R. Floyd, said to have been the oldest citizen of Floyd Co., died last week. He was 96 years old. _____ Advertiser. On October 25, 1915, as the sun was sinking deep into the crystal sea, the death angel crept into our home and claimed as His own our darling baby, little Ruby Louise. It was so hard to give her up, but we will say as Daniel did "The Lord giveth and the Lord taketh away, Blessed be the name of the Lord." Her little mission here on earth was very short. She was with us only three short months. While she was with us we were so happy. It was such a pleasure to love and care for our baby. Little did we know how soon, to Jesus, she would go. But Jesus said, "Suffer little children to come unto me, and forbid them not, for such is the kingdom of heaven." No lonely hours did I know for to my baby I could go. I tried to be a mother true, and do all for my baby that I knew. With tears, I fold away her little clothes--the sorrow it gives me nobody knows. Her little buggy too is put away, for in it she had slumbered day by day. But Jesus said to her, "Come home, for in this evil world you are too sweet to roam." The little eyes time is no more can your memory in death's embrace, and never until time is no more can you memory be erased. Oh! the pleasure it gives us to know that some day to our baby we can go. The golden gate swung open, a gentle voice said, "Come," the angels on the other side, beckoned our loved one home. Mr. and Mrs. R.R. Floyd. Last rites were held this afternoon in the Pleasant Hope Baptist Church for Charles E. Forrester, who passed away late Sunday night at his residence at Silver Creek. Officiating were the Rev. J.E. Smith, of Rome, and Rev. Herman Manning, Pastor of the Pleasant Valley (South) Baptist Church. Burial was in the Pleasant Hope Cemetery. Born on December 10, 1873, Mr. Forrester had been a resident of Floyd County for 50 years. He was a member of the Pleasant Valley (South) Baptist Church. Mr. Roy Lee Fortune, Jr., age 38, of Cave Springs, passed away Tuesday, November 17, 1998. Mr. Fortune was born June 15, 1960. He was of the Baptist faith. Survivors include his son, Roy Lee Fortune III of Silver Creek; his father and step mother, Roy Lee Fortune, Sr. and Dawn Fortune of Silver Creek; his mother, Denise Fortune of New Orleans, La. ; four brothers, Lee Fortune of Cave Springs, Steve Fortune of Lindale, Craig Fortune and Shane Fortune both of Silver Creek; and four sisters, Kim Fortune of Lindale, Samantha Eaton of Silver Creek, Dina Guzman and Juanita Allison of Douglasville. Funeral services were held Thursday, November 19, at the Lester C. Litesey Funeral Home chapel with the Rev. Lavonne Ward officiating. Interment followed in Northview Cemetery. Lester C. Litesey Funeral Home was in charge of the arrangements. W. D. Franklin died Monday afternoon at 5 o'clock at the home of his brother, Dr. H.B. Franklin, near the city. He was 92 years of age in April. Mr. Franklin was the oldest mason in Floyd County, having been a member of the order for many years and was a worshipful master of Caladonia lodge. He was highly respected and was well known throughout Floyd county. The funeral will take place this afternoon at 2 o'clock and the interment will be in Franklin cemetery near Plainville, and the remains will be laid to rest with Masonic honors. There recently died at his home near Rome, William D. Franklin, father of Dr. A.L. Franklin. He was a veteran, a Mason of high rank, and a man of splendid character. The following appreciation is from the pen of H.C.Hunt: Death, the common enemy, has again invaded our ranks and another beloved comrade has fallen, a true brave soldier has crossed over the river, and is now, let us pray, united again with Davis, Johnson, and Lee, and all the valiant host who have gone before where weary soldiers sleep in peace, where life's battle is ended, see no more of cruel war, of comrades slain, for they are dead, sleeping the sleep that knows no waking till the angel's bugle sounds the great reville to call them back to life. Thus one by one our comrades fall, as fall the withered leaves in autumn time, one by one their warfare over, they calmly lay their armor down and pass away. Upon the outbreak of the war between the states, he joined a calvary company that was oganized near Loudon, Tenn., and became a part of Forrest's original command serving through the operations around Donelson. After taking part int he great battle of Shiloh, Comrade Franklin was on a sick furlough for a time, when sufficiently recovered he was appointed steward in the hospital at Knoxville, Tenn. After the battle of Chickamauga, Comrade Franklin was attached to Dr.Franklin's hospital, at which time his devoted wife and mother-in-law tendered their services to the Confederacy. They were beloved by all who knew them, they were sweet and gracious in social life, a source of comfort to those in need of sympathy ready at all times to lend a helping hand to the unfortunate, their presence was like blessed sunshine, they were a true type of Southern womanhood. What grand nurses they were frequently assisting at the dissecting table bandaging the broken limb, by the side of the dying soldier as his spirit would take its everlasting flight, their prayers would ascend to heaven. These ministering angels of earth devoted two years of their lives to nursing in hospital work. All honor to the noble patriotic and zealous women of our beloved Southland. W.D. Franklin was born in Tennessee April 10th, 1822, and died at the home of his son Henry D. Franklin, Sept. 1st, 1913, aged 91 years. he moved to Gordon county in 1846. He was a Free Mason and as a token of love for their brother and of appreciation of his noble qualities in the Masonic order attended his funeral in a body. The great heap of beautiful flowers under which his lifeless body rests, placed there by loving hands tells the story of his worth in language far more eloquent and forcible that tongue or pen can do. It tells of his principles for which he fought and suffered, of his devotion to the Masonic order and of his love and affections for his family, his kindred, his friends and his countrymen. He leaves two sons, Dr. Albert Franklin, near Rome, Ga., and Henry D.Franklin, near Plainville, Ga. Comrade Franklin was of a positive character and strong imtellect, yet he was popular with all classes and had a kind word for all whom he met. He did unto others as he would have them do unto him. The last sad rites of his interment were pronounced in the beautiful burial ceremony of that order, the sevices were conducted by the members of Plainville Lodge, assisted by members of visiting brethren, who took charge of the remains at the conclusion of a brief service by Rev. Elam Culpepper. His body was tenderly laid to rest with Masonic honors. Doyal B. Freeman, 70, of Lindale Rte. 1, died Sunday at 12:45 a.m. in a Rome hospital. He was born in Floyd County Nov. 15, 1901, the son of the late Jeff D. and Mary Drummond Freeman, and was married Oct. 4, 1925 to the former Ethel Satcher, who preceded him in death Dec. 26, 1966. He married the former Esther Burkhalter Rampley June 29, 1967, who survives. Also surviving are three sons, James D. Freeman, Orlando, Fla.; Sidney D. Freeman, Fort Smith, Ark., and Elmer Freeman, Rome; one daughter, Mrs. Ruby Davis, Atlanta, three brothers, Franklin, Willie and Tholly (Thollie) Freeman, all of Rome; two sisters, Mrs. Kate Thrash and Kathleeen Gross, of Rome, three stepsons, Elmer and Gene Rampley, Lindale, and Donald Rampley, Dallas; one stepdaughter, Mrs. Howard Moon, Lindale; 11 grandchildren, several nieces and nephews. Funeral services were conducted today at 11 a.m. at the chapel of Daniel's Funeral Home with the Rev. John Flanigen officiating. Interment was in Wax Cemetery. Pallbearers include Luther Akin, Hugh Freeman, Bud Freeman, Winston Freeman, J.T. Freeman, Davis Freeman and Clinton Freeman. Daniel's Funeral Home has charge of arrangements. Mrs. Ethel Mae Freeman, 65, of 8 E. Glover St., died Sunday morning in a Rome hospital following a declining illness. Born in Bartow County April 22, 1901, she was the daughter of Sam Satcher and Seney Calloway Satcher. She had spent the greater part of her life in Floyd County, and was a member of the Hollywood Baptist Church. Survivors include her husband, Doyal B. Freeman; three sons, James D. Freeman of Atlanta, Sidney Freeman of Memphis, Tenn., and Elmer Freeman of Rome; a daughter, Mrs. Ruby Davis of Orlando, Fla., four sisters, Mrs. A. L. Branton, of Rome, Mrs. C. O. Fricks, of Rome, Mrs. Allie Ledbetter of Thomaston, GA, Mrs. Lollie Bozeman, of Rome and 10 grandchildren. Services were conducted Monday at 11 a.m. in the Hollywood Baptist Church, with the Rev. Ralph Dingler and the Rev. Glenn Boatner officiating. Interment was in Wax Cemetery. Pallbearers included the following nephews: Joe Branton, Lewis Branton, Eugene Branton, Alton Satcher, Arthur Satcher, Jr. and Donald Satcher. Daniel's Funeral Home had charge of arrangements. Mr. Bud Freeman, age 79, of 1841 Wax Road S.E., Silver Creek, Wax Community, passed away Wednesday morning in a local hospital. A native of Floyd County, he was born George Clifton Freeman on April 27, 1925, son of the late James Wesley Freeman, Sr. and the late Ruth Leola Shores Freeman. Prior to his retirement, he owned and operated Freeman's Stop and Snack in the Wax community for many years, after having been employed there since an early age. He was a member of Silver Creek Primitive Baptist Church. Mr. Freeman was a veteran of the U. S. Army, having served in the U.S. Army Air Corps and in the 95th Division in France, Belgium, and Germany during World War II. He was awarded two Purple Hearts. He was a member of the American Legion Post #5 in Rome Mr. Freeman was preceded in death by his parents, by a sister, Mrs. Eunice Beck, and by two brothers, James and Ralph Freeman. Survivors include his wife, the former Shirley Ann Lloyd, to whom he was married on June 4, 1949, a daughter, Mrs. Rona Freeman Crawford and her husband, Alan, of Silver Creek; four sons, Dane Freeman, and his wife, Ellen, Drew Freeman and Stacey Freeman and his wife, Renati, all of Silver Creek, and Scott Freeman of Palm Springs, Calif; 11 grandchildren, Andrew Freeman and his wife, Bethany of Beale AFB, Calif., Taylor Freeman of Sand Rock, Ala, Joshua Freeman of Carrollton, G, Asley Peschel, Austin Freeman, Faith Freeman and Silas Freeman, all of Silver Creek, Lindsey Freeman, Kansas Freeman and Kayla Freeman all of Adairsville, a great grandchild, Canaan Freeman of Beal AFB; two sisters, Mrs. Dorothy Robertson of Aragon and Mrs. Inez Gozzett of Rome; a brother Billy Freeman of Coosa; nieces and nephews also survive. Funeral services will be held Friday at 2 p.m. at the graveside in Wax Cemetery with Elder Lewis Norton and Rev. Elgin Williams officiating. The American Legion Post #5 Honor Guard will extend military honors. The family will receive friends at Henderson & Sons Funeral Home this evening from 5 until 7 p.m. At other hours they may be contacted at the residence. Honorary pallbearers are requested to assemble at the graveside in Wax Cemetery Friday at l:45 p.m. and include Ronnie Buford, Gerald Carroll, George Smith, grandsons, Andy Freeman, Josh Freeman and Austin Freeman. Henderson & Sons Funeral Home has charge of the funeral arrangements. Adairsville-Funeral services for George Monroe Freeman, 96, were held at 2 p.m. Saturday at Snow Springs Baptist Church. The Rev. Dewey Atchley and the Rev.James Ward officiated. Interment followed at the church cemetery. Mr. Freeman, a resident of a health-care center here, died Wednesday at a Rome hospital after a long illness. He was born Sept. 30, 1891 in Bartow County, son of the late Stephen Monroe and Mattie Lou Hazelwood Freeman. He was a member of Stoner Baptist Church where he was the oldest deacon. Mr. Freeman was a local contractor, and also operated Freeman's Feed and Grist Mill in Adairsville prior to retirement. Mr. Freeman was preceded in death by his wife, Octavia Viola Hight Freeman, in June 1945. Survivors include three daughters, Mrs. Louise Abernathy, Adairsville; Mrs. Helen Harkins, Milford, Ohio, and Mrs. Hazel Janet Mixon, Rome; two brothers, Newt Freeman, Adairsville and Dykes Freeman, Calhoun; 19 grandchildren 41 great grandchildren; 4 great great grandchildren, nieces and nephews. Henry Douglas Freeman, age 85, of 12 Wentworth Place, Garden Lakes Community, Rome, died Tuesday night, April 5, 2005 at a local hospital. A native of Bartow County, Mr. Freeman was born on Oct. 16, 1919, the son of the late Franklin Jeffery and Hazel Beatrice Branton Freeman. He was a member of Spring Creek Baptist Church and the International Brotherhood of Teamsters Local. Mr. Freeman was a World War II veteran, having served in the European Theater in the Battle of the Bulge and the Ardennes Rhineland with the U. S. Army. For 16 years Mr. Freeman was associated with the Yellow Freight Lines and prior to his retirement was associated with RCA Trucking Company having retired as a driver. Mr. Freeman was preceded in death by a son, Christopher Wayne Freeman in 1993 and was married on Dec. 24, 1950 to the former Marion Louise Thrash who survives. Survivors include his wife of 54 years, Marion Freeman; a sister, Bettye Ann Barrett of Rome; a brother, Hugh Freeman of Rome. A number of nieces and nephews also survive. Funeral service for Mr. Freeman will be held Friday afternoon, April 8, 2005 at 3 p.m. from the Parkview Chapel of Fred Talley's Funeral Home with the Rev. Jim Reynolds officiating. Interment will follow in the Oaknoll Memorial Gardens. Mr. Freeman will remain at Fred Talley's Parkview Chapel where the family will receive friends this evening from 6 p.m. until 8 p.m. At other hours the family will be at the residence. Nephews will service as active pallbearers. Fred Talley's Parkview Chapel Funeral Home has charge of the funeral arrangements for Henry Douglas Freeman. Mrs. J. K. Freeman succumbs to long illness. After several weeks of severe suffering the Death Angel claimed the life of Mrs. J.K. Freeman, an aged and beloved resident of 2nd Avenue. She was a victim of cancer. Mrs. Freeman was beloved and highly esteemed by all who knew her. She was president of the Lindale Aid Society some time before her illness. She is survived by her husband, two sons Arthur and Joe Freeman. The funeral and interment will occur today at 12 o'clock at Pleasant Hope Church and cemetery. Mary Anna Elizabeth Abrams (1860-1916) was the granddaughter of James and Anna Patty through their second child Mary J. Patty. Both of her parents are buried at Pleasant Hope Church cemetery, Silver Creek, Floyd Co., GA. Her father was James R. Abrams, son of William Abrams 1795 NC-30 Dec. 1862 prob. 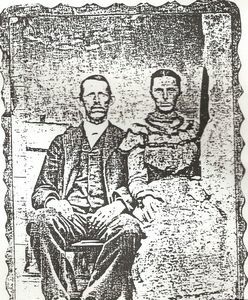 Cherokee Co. AL, and Sarah Ann McLemore 1809 NC-07 Feb 1858. I do not know where William and Sarah Ann are buried, but would like to have that information if anyone knows. Wesley Freeman Dead--"Uncle" Wesley Freeman, probably the oldest colored hackman in Rome, died yesterday. The funeral will take place at the home at 3 o'clock today. Freeman was one of the best known negroes in Rome, and his death removes another of the kind that white people respect and like to render assistance. Willie C. Freeman, 71, of 401 E. 19th St. died Thursday in a Rome hospital following a short illness. He was born in Bartow County Dec. 3, 1900, the son of the late Jeff D. and Mary Drummond Freman. He had resided in Rome and Floyd County the greater part of his life and for 21 years prior to retirement was asssociated with Fox Manufacturing Company. He was a member and former steward in the Methodist church. His wife, the former Mary Thelma Fricks, died Oct. 3, 1960. He was also preceded in death by a sister and five brothers. Survivors include four sons, Winston, Houston, Dennis, and Neal Freeman, all of Rome; two daughters, Mrs. Mildred Jarrell and Mrs. A.T. Bagley, both of Rome; two brothers, Franklin and Thollie Freeman, both of Rome; two sisters, Mrs. J.W. Thrash and Kathleen Gross, both of Rome; five grandchildren, two great-grandchildren and a number of nieces and nephews. Funeral services will be conducted Saturday at 2 p.m. in the Chapel of Daniel's Funeral Home with the Rev. Rogert Padgett officiating. Interment will be in Oaknoll Memorial Gardens. Pallbearers will include Herman Thrash, Alfred Fricks, Bud Elmer Freeman, Clinton Feeeman, Elmer Freeman, John Gross, Davis Freeman and Wayne Agan. The body will lie in state at the funeral home and the family will receive friends there today from 7 until 9 p.m. At other hours they will be at the residence of a daughter, Mrs. A.T. Bagley, Wellington Way. Cecil H. Frost 51, of Centre, Ala., Rte 2 died Sunday night in a Centre hospital following an extended illness. He was born in Cherokee County, Ala. Son of the late R. J. and Jimmie Price Frost. He was a farmer, member of Alexis United Methodist Church and a veteran of World War II. Surviving are his wife Mrs. Margaret Burk Frost; one daughter, Mrs. Johnny Williams, Centre; four sisters, Mrs. Grace Sievers, Los Angeles, Calif., Mrs. C.M. Thornton, Anniston, Ala., Mrs. B.G. Beaird, Denver, Colo., and Mrs. Billy May, Centre. Funeral services will be held at 2 p.m. (CST) Tuesday in the Alexis United Methodist Church. The Rev. Larry Harbin and Fred Johnston will officiate. Interment will be in Cherokee Memory Gardens. The body will remain at the Perry Funeral Home until one hour before services. Mrs. Evie Fulbright, 73, of Fairview Ave., died Saturday after an extended illness. She was born May 10, 1889, in Polk County and was a member of the Union Grove Baptist Church. Survivors include four daughters, Mrs. Sara Thomas, of Cedartown; Mrs. Florence Clinton, of Cedartown; Mrs. Letha Mae Mitchell, of Cedartown: Mrs. Jennie Lee Allen, of Chattanooga, Tenn.; one sister, Mrs. Will Strickland, of Cedartown; one brother, Charlie Parish, of Cedartown, eight grandchildren. Funeral services are incomplete and will be announced later by the Olin Gammage Funeral Home. Funeral services for Rufus Melvin Fuller, 45, who died at his home in Texas Valley Saturday morning after a lengthy illness, will be held from the Sand Springs Baptist Church this afternoon at 3 o'clock with the Rev. W.F. Conn and the Rev. Gordon Ezell officiating. Burial will be made in the church cemetery. Mr. Fuller was born in Floyd County on Jan. 2, 1896 and has lived in Floyd County all his lilfe. He was a veteran of the first World War and a member of the American Legion. He was also a member of the Christ Church. Surviving him are his widow; a step-daughter, Annie Ruth Hammons; two brothers, Grover and Guy; four sisters, Mrs. Herbert Vanderfort, Spring Garden, Ala.; Mrs. Jessie Wiggins, Mrs. Ivey Jones and Miss Louise Fuller, all of Moultrie, GA.
Funeral services for C. Beecher Funderburk, who died Saturday, were held at 11:30 a.m. today in H.M. Patterson and Son Spring Hill Chapel in Atlanta with the Rev. E.B. Shivers, Jr. officiating. Interment was in Arlington Cemetery.